[In Progress] Return of the Explorers Event! 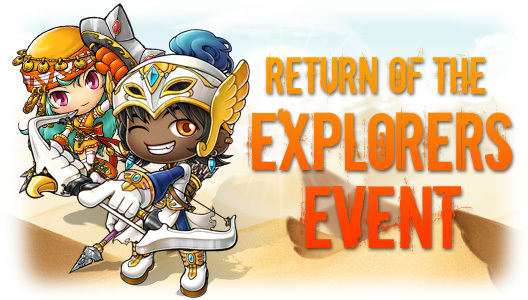 Return of the Explorers Event! Thread: [In Progress] Return of the Explorers Event! In the past year MapleStory has seen the arrival of many new classes. Last summer the Cygnus Knights arrived in Maple World to battle evil in the name of the Empress. Then came the Aran and Evan, legendary heroes who returned to battle the Black Mage. Yet one group was forgotten – the mighty Explorers, the intrepid pioneers who battle monsters every day without fanfare. Where is their celebration? Explorers worldwide feel a new surge of power as old skills get rebalanced and enhanced. Let’s use that in a great leveling event where they can get great new items to match their new balance! When your character reaches level 10, speak with Cassandra to receive a weapon based on your class. When your character reaches level 20, speak with Cassandra to receive a weapon based on your class. When your character reaches level 30 speak with Cassandra to receive an armor piece based on your class. When your character reaches level 40 speak with Cassandra to receive a medal! When your character reaches level 50 speak with Cassandra to choose from one of three Adventurer’s rings. To celebrate Explorers, even Maple World’s monsters are getting involved. Monsters are now dropping a mysterious “Explorer’s box.” Inside the box you’ll have a chance to win some fabulous online and offline prizes. So sharpen up those blades, tighten those bow strings, and put on your wizard hats, and get yourself to a hunting ground! Show your Explorer some love! Get some NX today! About time we get another "gacha-type" box event that doesn't require NX. So... what's the fastest explorer to get to 50? I was thinking of a gunslinger for fun but it might be hard/slow. I see nothing about account-tradability on those rings. So it looks like they're keeping the ring event the same as it was in KMS. I was fearing that they'd turn it into some cash-related thing and move the level requirement up. I'm thinking Gunslingers will be rather quick to level after this patch, along with the obvious warriors and Infighters. I'm probably going to go Page, Crossbowman, Bandit or Infighter, and Gunslinger. 1-50 would probably be some warrior I guess. And I think the boxes will require NX... or they're not listing all the potion rewards you can get. Glad they kept adventurer rings the same. looks to be a nice event this time around. how fast do sins level? i was thinking about making one for the ring since i already have a maple claw and kandayo. Gunslingers level at first, but I'm not sure now with the explorer update. Haha, watch them screw up and put the quests as "all adventurers over lv 50 get a ring" As if it was an Evan or that... FREE RINGS EVERYONE. LF> next patch. 5 days seems too far away :[. I don't see anything about having to start a completely new adventurer but I'm assuming that's still the case. If not.. lawls. This would be nice. Why should I make a new character if I already have an adventurer in its 4th job? I've gone through the levels already, I shouldn't have to make a new one for the benefit that new adventurers get. And why the hell do they keep calling us Explorers? There are quest chains that'll put you to level 40 without needing to grind too much. Did these on my Gunslinger, along with a couple other quests that I just passed through, and I never trained without being working on one quest or another. 30 Evil Eye Eyeballs and Wild Boar Leather is the closest you get to grind. With the no minimum range, Kerning Square will be a lot easier, and Double Shot's extra damage can't hurt. For what it's worth, my opinion of first job/early 2nd job right now, just for ease of questing, leveling etc. But hold on! There's more! Maple Admin NPC is celebrating the return of Explorers too and she'd like to give a prize to all Maplers. When you log out, you'll get a chance to receive a totally random prize! I assume that when they say 'when you log out', they really mean 'when you log in'. Because we are Explorers of the Maple World.